Now I finally make it to reviewing whom I currently believe to be my favourite of the Three Greek tragedians - Euripides. I'm going to try to shorten my reviews and post them all under this one entry. All the plays listed above though are not chronological - they can all be read as stand alone works. I believe this play is known as Euripides' pinnacle - so if you're going to start anywhere, you should start here. 'Medea' blew me away with its raw and emotional power. 'Hell hath no wrath like a woman scorned' basically sums up the premise here. Medea accomplishes great horrors and moves away from her family in order to be with her husband, Jason, who leaves her for a princess in order to (as he explains) provide a better life for their children. Medea is banished from her homeland but convinces the King (preying on his weak humanity) to let her stay one day in her current house to plan her move. She plans the move, but also a revenge plot in which she kills the princess, the King and eventually murders her own sons. Depending on your point of view, Medea can be viewed as a hero or a villain. She stands up for Greek women everywhere that have been trodden on and keeps firm to her resolve. She is no Dido, who kills herself when she cannot keep Aeneas (in the Aeneid) from leaving. She makes a plan and 'overcomes' her own feminine weakness when she kills her innocent children. Contrariwise, she is unable to overcome her emotions and turns her anger into revenge instead of that of acceptance - and she consequently ruins many lives in the process. She believes that she's won, but in a situation like this, no one can ever win. It would be interesting to see how Medea feels in her declining years... something we do not get to see. Your viewpoint on whether Medea is justified in her actions or not says a lot about who you are as a person and what you've gone through in life. While discussing a work like this, it's evident that a gender divide still exists 2500 years after this play was written and both men and women scorned have further thoughts to share on the subject. Jason, by contrast, is unarguably unjustified in leaving his wife and children for another. There is no doubt that he is at fault, but he pays for his actions at such a level that you cannot help but feel for his suffering. DISCLAIMER: Some of these quotes throughout are very anti-feminine. Keep in mind that these do not reflect my opinions. Just peace and quiet as I grow old. Is best by far, in name and practice. The noise of war, the look of steel, makes her a coward. They live exempt from many troubles. While Medea is a story of revenge by two mortals, Hippolytus and The Bacchae are stories about revenge between Gods and men. Hippolytus is my favourite of all the Greek tragedies that I have read so far. Hippolytus, son of King Thesus, has shunned the Goddess Aphrodite. He refuses to fall in love and is quite contented with living a life of gymnastics (sport) and praises Artemis, the Goddess of chastity and wildlands. What makes Hippolytus such a tragic character, is that he shuns love but is eventually destroyed by it anyways. When his step mother (Phaedra) falls in love with him, he is told by a nurse who takes pity on Phaedra, whom is starving herself in order to die without tarnishing her children's names. Hippolytus rejects her and she hangs herself, but somehow implicates Hippolytus in her suicide note. King Thesus, struck with grief and anger, will not listen to Hippolytus' pleas and asks the Gods to destroy him after he banishes him from the house. Poseidon ends up killing Hippolytus and Aphrodite finally has her revenge. Of course, King Thesus finally realizes the innocence of Hippolytus on his deathbed and begs forgiveness (which is granted). Hippolytus is innocent of everything other than hatred towards the Goddess Aphrodite. For this innocence he is rewarded with the tragic death of his stepmother (and the angst that her love brings), shunned by his father and killed by him and the Gods. Phaedra is innocent with her love, but the revenge (intended or not) makes her guilty. If she took the secret to her grave, Hippolytus would not die. If she simply did not write her note, Hippolytus would not die. However, both of these events occur and everyone other than Aphrodite suffers. Absolutely powerful story - one I recommend with earnest. And when we are dead, is there a happier world? Knowledge is hidden from us in clouds and darkness. This is my least favourite of the works, so I won't go into much detail. The story is about the revenge of Dionysis, Greek God of wine and mirth, on Pentheus - a man who refuses to pay the god libations. Dionysis has a spell under all the women of the area, who live naked in the forest. He put Pentheus under a spell, and he dresses up as a woman to go talk to his mother in the forest. The women spot him and his mother rips off his head and the women tear off his limbs (literally). When her mother comes back to display the head (which she believes is of a lion) to her husband Cadmus, he shows her what she has done... and then Dionysis gives a soliloquy that basically says that if you don't worship him, there will be hell to pay. Again, not my favourite... but perhaps if I read the other two related plays (Iphigeneia at Aulis and Alcmaeon in Corinth), I'd glean more from them. Euripides may not have enjoyed as much success of Sophocles or even Aeschylus, especially during his lifetime, but there is no question in my mind that his plays are full of morals and tidbits of wisdom that the others do not present at such a depth. Euripides reads much better than Aeschylus and Sophocles, but for whatever reason his plays, while successful, did not transfer as well to the stage as his two predecessors. As a reader, Euripides presents the stories in order to give you choice - and what you choose reflects a lot about you as an individual. Euripides is much better for book clubs, because it stimulates tremendous debates and this discussion teaches you about yourself as well as others around you. 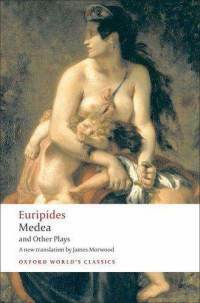 Euripides is truly a treasure - one which any fan of literature should enjoy. Thanks for the great commentary. I love reading Euripides. Especially compared to Aeschylus and Sophocles he seems such a radical. As you point out his plays seem to very much identify with the powerless. I do see Medea as a bit of a heroine and detect sympathy for the plight of women in that work. Have you ever read The Trojan Women? It is a very harrowing and imparts similar sentiments. I haven't had a chance to check out the Trojan Women, but I will probably delve into most of Euripides' work in the future. You make me want to read Euripides. Medea sounds interesting. I have been evading any encouragement to read Greek tragedies, because I think they will cause me so much anger and sadness. But I'm taking a Greek and Roman Myth class this September and have to read them anyway. Thanks for the interesting review.